Showing 91–100 of 51,755 items. Whiten teeth and get close-up confidence with Trident White Sugar Free gum, the easy way to freshen breath. 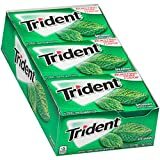 Two pieces of Trident White Sugar Free Gum after eating and drinking helps whiten teeth in as little as four weeks. With 30% fewer calories than sugared gum, Trident White help restore your mouth's pH balance to maintain a healthy smile. Pop a piece of mouthwatering Peppermint Trident White for a refreshing taste that keeps going.